This rural water supply three-phase project will provide improved water to 2976 people in 4 Villages in Andoung Snay Commune in Kampong Chhnang Province, Cambodia. The beneficiaries will support the sustainability of the project. The project will be implemented by East Meets West staff based in Phnom Penh, with technical assistance from experts in East Meets West Vietnam. A Water and Sanitation User Group will be formed from members of the Commune to assist with project implementation. The project will also be supported by the Commune Council, Village Chiefs, and Provincial Department of Rural Development. Design team recommended collecting further water sample to confirm the water quality during dry season. With assistance from WSUG and PDRD we pumped the well for 2 hours and collected water sample for water quality testing. Water level in well recovered quickly once pumping had stopped. Met lowest price tenderer for construction of the treatment system and pipe network to discuss and review the construction cost. After reviewing and discussions, the Contractor agreed to send a new schedule of quantities within this week. For the available construction budget, it is likely that the treatment plant will need to be reduced in size to supply 250-300 households. EMW will follow up with design team regarding re-design of treatment system and the the contractor regarding proposed modifications. The WSUG have a clear understanding of the issues and challenges faced during operation and management of a water supply system. They also learnt about methods to encourage the community to connect to the system, potential technical issues, dealing with maintenance issues, collecting fees, leakage in pipes / meters, and understanding how to build communication between their networking groups for assistance. The WSUG emphasized that they are so happy with this opportunity to visit those pipe water supply system and get a clearer understanding of the importance of water and sanitation for community health and improve people access to safe drinking water. They said that these two site visits were very helpful and useful for them. Please refer to the field trip report for more information. Upon arrival at the site of the proposed new well, we discovered that the existing well is 45m deep and supplies 10 households with untreated water. However, there is only a little water available from the well during the dry season, it mostly dries up, and so is only used in the wet season. We discussed other potential locations, unfortunately the WSUG and PDRD were unable to identify any other suitable locations that have a good year round supply. We will therefore continue with the original well location and ensure the treatment plant is designed accordingly. The WSUG have prepared a good hand drawn village map, indicating the location of roads and houses. Discussed draft bylaw with WSUG and reiterated that it was their responsibility to review the document to ensure that they have a suitable bylaw. With assistance from WSUG we pumped the well, taking measurements of water level regularly and collected water sample for water quality testing. Water level in well recovered quickly once pumping had stopped. Approximately a 100mm drop was noted in the adjacent dug well during the pumping (approximately 10m from new well). 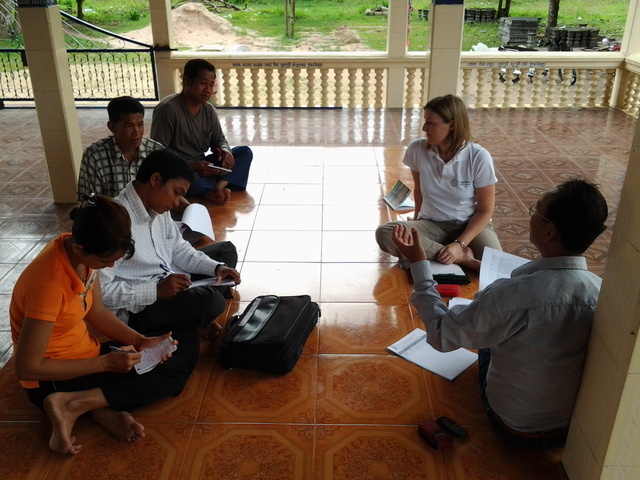 Successful meeting with the WSUG to discuss the project, we conducted training for carrying out the household baseline survey, and a study tour to 3 schools in Kampong Chhnang. The WSUG were very happy with the visit, they appreciated the study tour and felt able to make an informed decision about their water supply. The water supply system will be managed, operated and maintained by the Water and Sanitation User Group (WSUG). A fee for initial water supply connection and water use per litre will be collected to fund ongoing operation and maintenance. The fee will be set by Commune Council and WSUG. East Meets West will provide ongoing technical advice and will undertake monitoring and evaluation for 6 months following commencement of operation. The Commune has only one available well location and the water quality is poor. The treatment plant will be designed to treat the poor quality water, though the cost of construction and operation will be higher.